A nice blend of the best Top 40 the year had to offer! That’s what the latest fitness mix features! Highlights include “Happier”/Marshmello, “Thank u, next”/AG and “Youngblood /V. S.O.S. / 5 Seconds of Summer V. Rihanna. 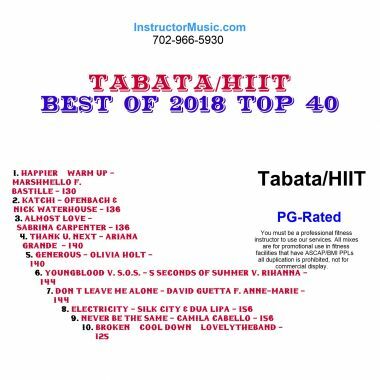 We also included the favorites “Generous/ Olivia Holt, “Never Be the Same/Camila Cabello and “Almost Love/Sabrina Carpenter. This mix is PG-Rated.